The Highlands County Tennis Association Of Sebring, Florida is a not-for-profit organization dedicated to supporting and promoting youth tennis in Highlands County. In 2012 we awarded academic scholarships to 4 deserving graduating seniors. Welcome to the Internet-home of the Highlands County Tennis Association. 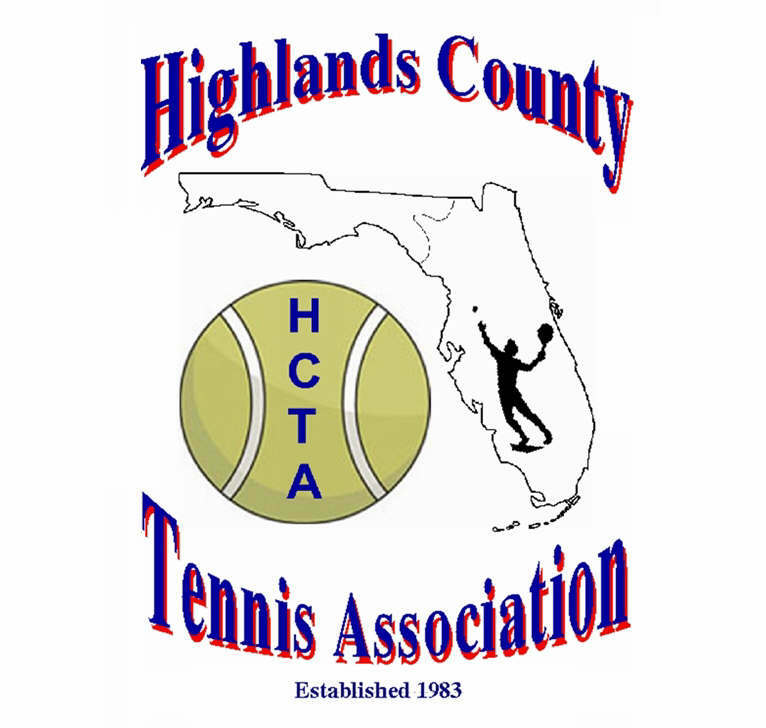 The HCTA wants to welcome visitors and people relocating to this area, and to extend to you an invitation to come join in the fun at the Thakkar Tennis Center, which is owned by the HCTA, and has the only clay courts in Highlands County, FL. We have a number of activities going on year round at TTC. To get you started, we have drop-in tennis every Monday, Wednesday, and Friday - year round. With this format, whoever shows up gets to play, and you don't have to call to say you are coming! Really, just show up. All levels are welcome. Play begins at 08:30 AM and lasts until about 10:30, and you don't have to be a member. This is where almost everyone new to our club starts off. You will find opportunities to join a league and play others at your level, or just continue playing in the drop-in league. You will find several phone numbers throughout the pages of this site. You may call any one of them to talk to a member, an officer, or a teaching pro to answer any questions you might have. The HCTA will use this website to keep our members and tennis friends updated on what is going on at our club. We will be adding announcements for upcoming events - tournaments,youth activities, social events, meetings, etc. We plan also to have the weekly newsletter of the United States Tennis Association, of which, we are a member. So come back and visit often. We have the only clay courts in Highlands County - six of them. The court surfaces are made of Har-Tru, which is called "American" clay. Har-Tru is made of finely crushed green stone found in the Blue Ridge Mountains of Virginia. The first Har-Tru court was constructed in Hagerstown, Maryland in 1932 and today it is the number one clay court surface in the US. Ok, so why are we so keen on on playing on clay? There lots of reasons, but we'll just mention a few. First and foremost are the superior health benefits. Har-Tru's granular surface acts as a shock-absorbing cushion, allowing players to slide into their returns. This prevents the joint jarring stops all too common on hard surfaces - resulting in 85% fewer injuries than on hard surfaces. Har-Tru courts promote the game for life, from early childhood into retirement. Avid players find that Har-Tru courts allow them to play the game every day without soreness or pain. Clay courts, have several advantageous playing characteristics. They provide a consistently slower ball bounce than other surfaces. This results in longer rallies, a greater variety of strokes and a more controlled game. It's the surface 88% of the world's top 10 players grew up on. The United States Tennis Association is now encouraging its most promising players to train primarily on clay tennis courts by installing Har-Tru courts at all of its national training centers. The down side is that clay courts are more costly to maintain than are hard courts. This is the primary reason that the HCTA charges membership dues - which must cover these costs. An interesting tidbit of information: The US Open tennis tournament got its start in the 1800s. It was originally played on grass. Throughout the years, tennis players complained about how the ball bounced on the grass courts of the West Side Tennis Club. In response to their concerns, the court surface was changed to Har-Tru clay courts for the 1975 US Open tournament. In 1978, the US Open tennis tournament changed venues again and moved to Flushing Meadows, NY, a hard-court venue where it continues to be held. Jimmy Connors is the only player to have won the US Open championship on all three surfaces. He won on grass in 1974, on clay (Har-Tru) in 1976 and on hard court in 1978. Chris Evert in the only woman to win the US Open championship on clay, having won in all of the three years it was played on Har-Tru (1975-1977).